This marks the sixth consecutive year for what has become the largest standup paddleboard race on the east coast. Make plans to participate or spectate during the 6th Annual West Marine Carolina Cup April 19th - 24th. Presented by Surftech, this year's race is bigger and better than ever! 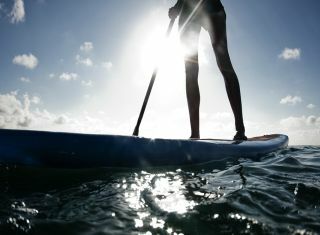 Athletes from far and wide are expected to attend this event, which kicks off the SUP race circuit season. Along with demos and clinics plus before and after parties, the Carolina Cup features 4 courses: a kids course, the Harbor Island Recreational "fun" race, the Money Island open race and the coveted but treacherous Graveyard Elite Race. In 2012, the Carolina Cup made the news as the largest race on the East Coast with over 400 paddlers turning out for the first day of races. In 2013, over 600 hit the water and over 700 paddlers participated in 2014! Last year's Carolina Cup was recognized as the largest SUP event in the world. This year is expected to be another record-breaker with around 800 paddlers expected! According to the event's organizers, "Competitors include Olympians, world-record holders, and champions in the disciplines of standup, prone, surfski, and outrigger canoe paddling." Australia's Travis Grant will be back to defend his title as the male champion of the brutal 13.5-mile Graveyard race. According to Grant, "The Graveyard race is a very fitting name. It is just that, a tough one. Anyone can potentially win, there are a lot of different elements to get right: surf, flatwater, inlet currents, wind and there's always a slight bit of luck involved." Grant defeated the 3-time title-holder last year, Danny Ching who has been ranked #3 in the world. Ching, who hails from Hermosa Beach, CA, will be back again this year as well! Grant and Ching will be joined by an impressive group of international competitors from over fifteen countries, including New Zealand, Australia, France, Canada, Spain, and Mexico. An exciting new event will be unveiled during this year's competition: six-man Hawaiian outrigger canoes, or "OC-6", will be competing at noon on Sunday, April 24th. The Carolina Cup's race director Mark Schmidt believes that this will be the first event of its kind in the Wrightsville Beach area. Heats will take place around Harbor Island in Bradley Lightning outrigger canoes, which were commissioned by Reggie Barnes of Eastern Surf and Skate Supply. This is huge folks! Some of the biggest names in Hawaiian outrigger paddling are expected to attend. Race director Mark Schmidt reflected, "To see an event like this would typically require traveling to California or Hawaii. It will be a great show." There will also be an outrigger clinic taught by designer Johnny Puakea, who is the founder of Puakea Designs-plus he's Danny Ching's coach! Other clinics and demonstrations scheduled throughout the five-day event will feature many of the top paddle experts in the SUP world, including Larry Cain, Travis Grant, Lina Augaitis, Dan Gavere, Dr. Bob Arnot, Fiona Wylde, and Zane Schweitzer. Each clinic is unique and addresses a different SUP topic. Please be aware that clinics have a limited number of spaces, so register early to secure your spot. The event's Demo Zone will give visitors the chance to try boards, canoes, and a variety of equipment. In fact, around sixty vendors are slated to have the latest equipment, boards, and boats on display. The Blockade Runner Beach Resort will be the venue host once again and serve as the hub for all starts and finishes. Please note that a portion of event proceeds will benefit The Ocean of Hope, a team of paddlers dedicated to the sea of people affected by cancer.